Key Features: All-black paint job. Stained-glass windows. Volkswagen Superbeetle welded to top. Complex Says: W...T...F? That was the first and only thing we thought when we first laid eyes on this thing. That and "is that a beetle glued to the roof?" 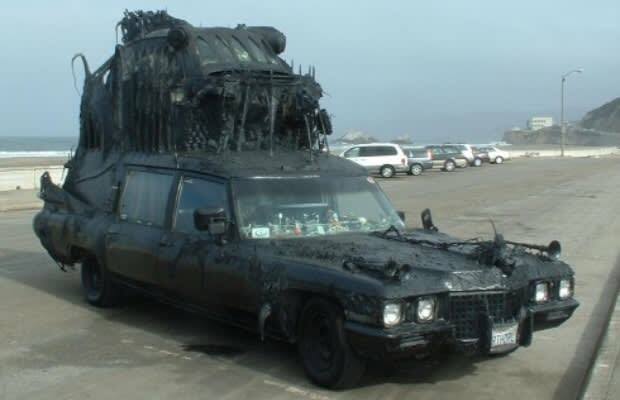 In all seriousness, this hearse has been on the Discovery Channel and been featured in a documentary called "Automorphosis." It also currently resides at the Art Car World Museum, in Arizona. And despite the fact that it's just about the weirdest thing we've ever seen, we have to admit that it's kind of creepy and kind of cool at the same time.